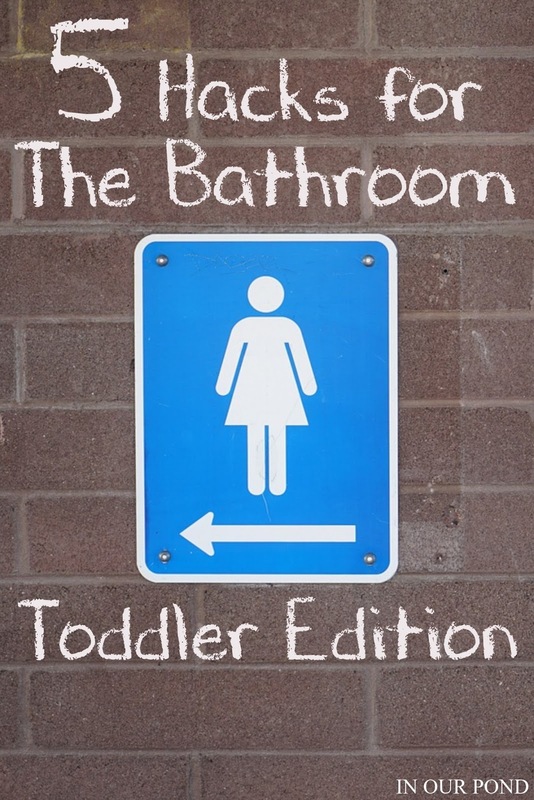 We change diapers in the bathroom and use a fun place mat as a "dirty feet" catcher. As you can see, we duct taped it to the wall, which is pretty tacky, but it's helped a lot to protect the wall. 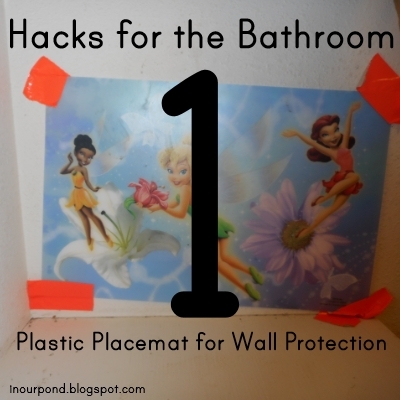 Unfortunately, I didn't think of this idea until we already had footprints on the wall. Don't make my same mistake- protect your wall today. As a bonus, the kids love to talk about the placemat as they're getting their diapers changed. Imagine how much millage you could get with a numbers or alphabet one? Our bathroom has a counter/table next to the sink without a cabinet under it. 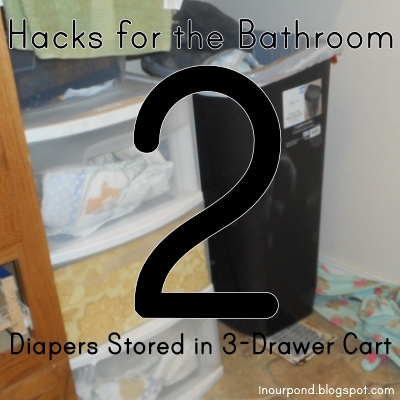 We have a garbage can (a kitchen-sized one) for diapers and a 3-drawer cart for diaper storage. The cart was especially helpful when all the kids were wearing different sizes. Now, we keep regular size 6 diapers in two of the drawers and "night diapers" in the other one. I really love this drawer cart! There is a plastic bin on top of the cart with diaper rash cream, non-latex gloves, and random tub fun (like color tablets). Amazingly, this is the only bin that the kids haven't gotten into yet- guess it's next. This hack has 4 parts. 3a- When you have lots of little kids, it's best to color-code them. Dragonfly is pink, Skimmer is blue, and Tadpole is green. Whenever possible, I buy things for the kids in their assigned colors. It makes so much less fighting. 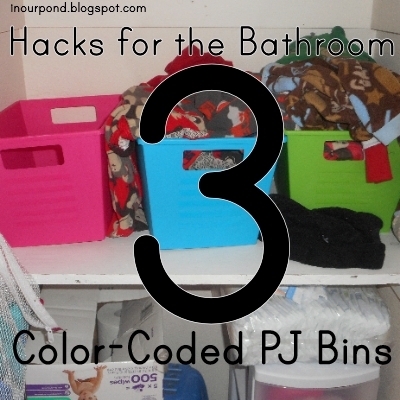 3b- We store their PJ's in these colored bins that I bought from the Dollar Tree. 3c- The mesh bag on the left is hanging on a cup hook and is for dirty kids' underwear. It helps them not to get lost and makes it easier to put them away when they're clean. 3d- The bottom right corner shows another 3-drawer cart where we store the underwear. 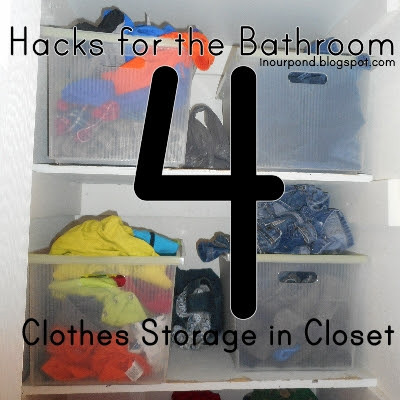 We also have room to store clothes for the two younger boys in the bathroom closet. Skimmer has the two top bins and Tadpole has the two bottom bins (one for tops, one for bottoms). We don't store clothes in the kids' room because I don't like picking up clothes over and over. This system means that the kids can't reach their clothes. It's one less area for the kids to destroy. 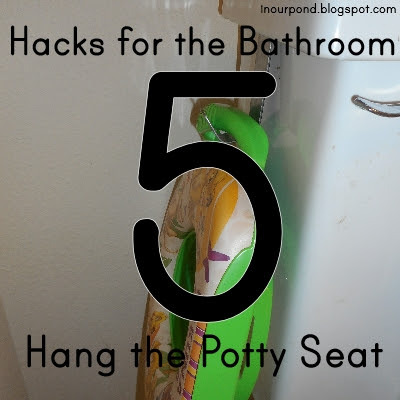 Lastly, we hang the kids' potty seat on the toilet bowl for storage. The hook is a kitchen towel hook (like this). The kids can take the toilet seat down, put it on the toilet, use it, and hang it up again. Most of the time, though, they don't use it. We could almost get rid of it, except that I have one more kid to train. That's the end of my list. 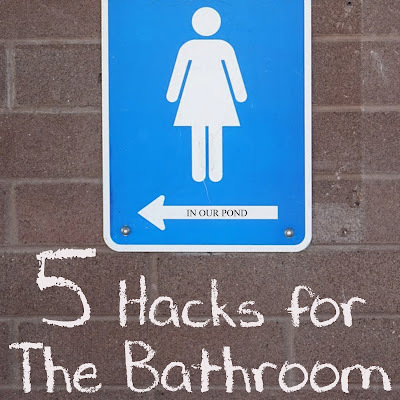 What are your favorite bathroom organization items? Please comment below.